Twitter appears to have notified a number of establishment media publications ahead of its permanent ban of Alex Jones, while neglecting to inform conservative media. A tweet from CNN’s Oliver Darcy was published at 4:45 p.m. eastern time, coinciding precisely with Twitter publicly announcing the ban. CNN could not have written the article beforehand unless Twitter notified them of its decision in advance. Darcy is the CNN activist reporter who repeatedly agitated for Twitter to purge Alex Jones, publishing articles about the Infowars host’s alleged terms of service violations. Darcy would eventually catalyze Jones’ ban, which Twitter justified by referencing Jones’ heated exchange with Darcy at yesterday’s congressional hearings with big tech executives. Along with Democrat politicians, CNN has ceaselessly lobbied for its competitors in the alternative media to be blacklisted online. 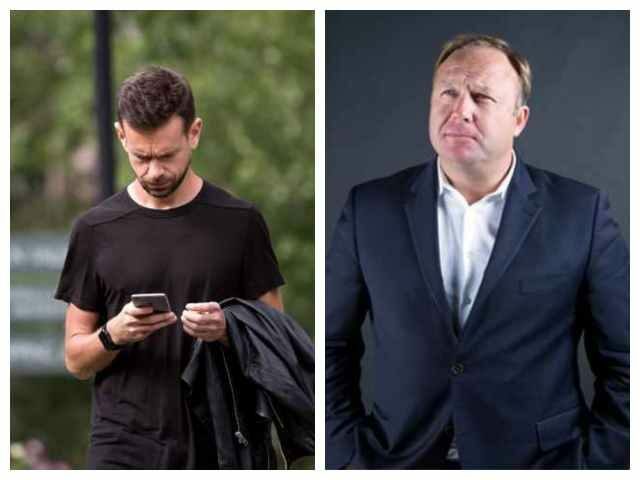 Twitter said the video of Jones calling Darcy an “anti-American, anti-free speech coward” constituted “abusive behavior,” even though it was conducted outside of the platform (Twitter gave itself the authority to police users for offsite behavior earlier this year). Other establishment publications that ran full articles on Jones’ ban at the same time as Twitter’s announcement included BuzzFeed News, the Associated Press, and the New York Times. No conservative-leaning media source appears to have received advance notice. A source at Fox News said they “hadn’t heard anything” ahead of the ban. Fox did not run an article on Jones’ ban until an hour after Twitter’s announcement. The Wall Street Journal posted an article several hours after the ban as well.